My favourite is to make a Gluten Free Tabouleh. Cook quinoa and allow to cool. Add a handful of chopped flat leaf parsley, a handful of chopped fresh mint, finely diced tomato and red onion, a good squeeze of lemon juice and a glug of your favourite olive oil. Mix together – oh my goodness – delicious. Add cubed feta or a dollop of goats curd for that extra bit of decadence! Mix through handful of baby spinach leaves as soon as cooked and top with a runny poached egg… oh yeah! Once cooked, crumble on some fetta or goats curd and top with finely chopped parsley and a squeeze of lemon juice. Just the same way as rice – simply add the appropriate boiling water (450ml per 225gm quinoa). Stir until all seeds are covered in water, and then start the cooker (as per manufacturer instructions). It will take approx. 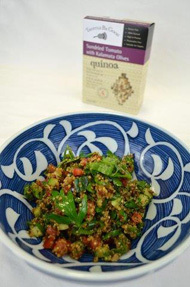 18 mins to have beautifully cooked quinoa – just be careful, some rice cookers are known to stick! Unlike rice you can stir quinoa a few times while cooking to prevent burning in the bottom of the pan – you’ll know your rice cooker and its idiosyncrasies! Simply add the appropriate boiling water (450ml per 225gm quinoa). Stir until all seeds are covered in water, then 16 mins, 100 degrees, reverse soft stir will do the job. It is not as perfect as other methods of cooking due to the stirring motion but it’s easy! This is based on an 1100 watt microwave – simply add the appropriate boiling water (450ml per 225gm quinoa) to a large microwaveable container with a lid (it will boil up the sides). Stir until all seeds are covered in water, cover with lid and cook on high for 5 minutes, stir, then on 50% (or similar) for 10 minutes. Let it sit for a few minutes to finish cooking. Microwaves do vary in power so check what power yours has.